A handful of taxi drivers say their religious beliefs are the reason they don't want to drive cabs with Gay Games ads. 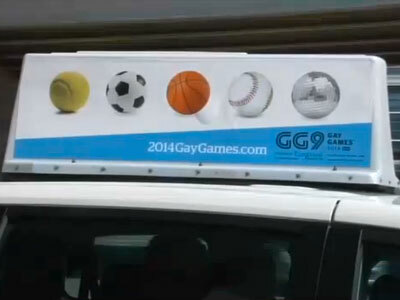 Some taxi drivers in the Cleveland area are refusing to drive cabs with rooftop signs advertising the upcoming Gay Games, citing religious beliefs. Each of the three taxi companies that serve the Cleveland Hopkins International Airport have been notified that cabbies don't want to drive the cabs, Cleveland's Plain Dealer reports. Patrick Keenan, the general manager of Americab, said two of his drivers said they do not want to drive cabs with Gay Games placards because of their Muslim faith. "We don't have any objections to the signage," Keenan told the Plain Dealer. "We're fully supportive of the games. We're not in concert with [the protesting drivers] on that. We don't share those views." The two other companies, Ace and Yellow Taxi, reported that some of their drivers have objected as well. Seventy-five cabs are affiliated with the airport fleet. According to the report, the companies will add metered taxis to the fleet of airport taxis, which charge fixed amounts based on destination zones, until they can find replacements for the airport drivers.